Third day in Venice is a free day for WTT (Women Traveling Together) so most of us head out in the Venician lagoon towards the islands of Murano, where Venician glass is made, and Burano, where homemade woven lace is created. This is definitely a shopping day. After spending the morning on Murano at the glass place mesmerized by the craftsmanship of the chandeliers, glasses, jewelry and art works, we sailed to Burano, a place with brightly-colored houses and soft breezes by the canals. It was lunchtime, and we were starving. We didn’t have a lot of time (2 hrs+) to explore the island, and we didn’t want to eat the “traditional” 2-hr meal Italians usually serve: the antipasti, the primi platti (first course, usually pasta), the secondi platti (second course, a meat or fish dish) and dolci (dessert) with coffee. We couldn’t linger long, even when we wanted to. 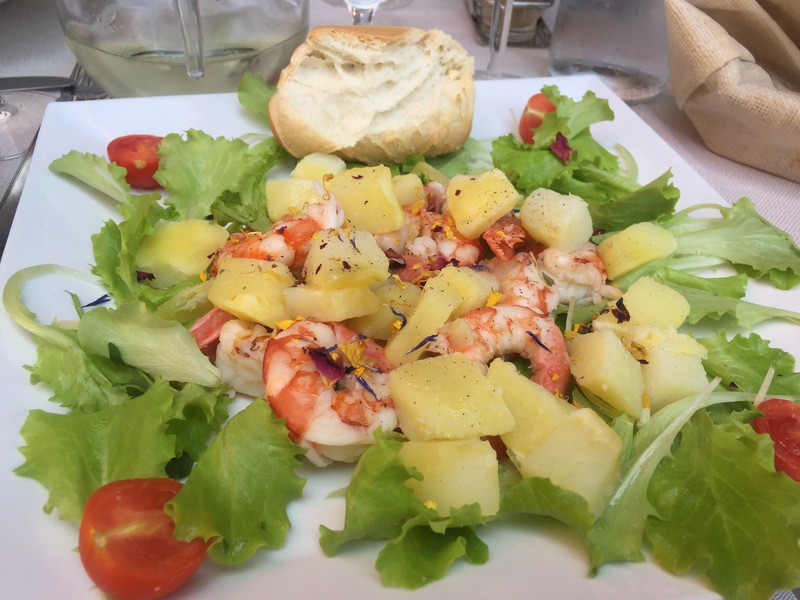 I wanted some seafood, since it was fresh here (we were on an island, after all, in Northern Italy), and a salad would be nice and quick. The prawns (shrimp) were excellent, very succulent. They were served on a bed of greens with slices of boiled potatoes, which I wasn’t expecting to see on an island menu. The edible flowers were a nice touch. Very clean taste, very nice presentation. As we toasted ourselves with glasses of the house white wine (fruity, with grapefruit essences), I saw Loretta, another of the WTT crew, holding her glass of limoncello, with a sly grin. As if she had silently had dared me, I ordered limoncello as well, and talked my tablemates into it as well (Olga, Becky and Erin). Since that day, we have been sipping limoncello for the rest of the time in Italy. I was tipsy after lunch. I remember some things happening: I bought a beautiful white woven linen dress/skirt, I got lost trying to find the boat tram with Erin (it was hilarious, we had fun walking together) and we had some decent gelato, but this was before visiting Perche non? in Florence, which is the best gelato in the universe. Burano was so serene, its vibes were great. I would could back here again. However, I can’t wait to get out of Venice and keep moving & exploring. Love your commentary on our wonderful lunch on Burano!! !